Here at Dxb blog we don’t just focus on what’s in Dubai and the UAE we also like to share our travel experiences from the UAE. This particular warning is about the airline PIA (Pakistani International Airline) and our experience. We DO NOT recommend this airline for flights to Pakistan at any cost or under any circumstances! First we wanted to give you a bit of our background info. PIA is an airline with a lot of history of training pilots and air staff who now work for emirates, their planes have been replicated or many airlines have based their planes upon PIA, and they were amongst the first airlines to offer in flight entertainment. Back in the day, PIA was the buzz in the air! However now… We regret to say… It is not worth your time or money…… Standards have been lowered significantly. Here is an account giving ONE way. This is a first hand account from someone in our blogging team! The first trip I made with PIA was in December 2010, a short Christmas break with my mother and 5year old niece. We had two main suitcases booked into the cargo of the plane and a few general handbag and childrens trolley case in our hand luggage. This flight was from the UK (Birmingham), directly to Islamabad. Upon arrival, after waiting for over 45mins a man announced that some of the luggage did not arrive, and the belt stopped with no further luggage coming through. We were told there was no space on the plane. We didn’t receive one suitcase which contained the little girls clothes (niece) and a few gifts for her relatives. We filed a report, and were not given a proper complaint form or number but a mere short 7 digit number as the “complaint number” , after returning almost everyday for 5days to find it, we gave up and travelled further into the country to see relatives as we were told it would arrive in a few days. We were in the country for 20days and the last 6days were spent in the capital with NUMEROUS visits to the airport, but no sign of the lost luggage, and as the final day drew upon us, we boarded the useless PIA flight after an upsetting holiday without our necessities. Little did we know this was the FIRST OF MANY INCIDENTS. This suitcase was returned 4months later to our relatives in Islamabad, with a few things missing, the incompetent behavior of this airline was unbelievable. Note: there were things such as jewelry and money missing in particular, maybe we shouldn’t have packed them, kept them with us? But how were we to know PIA would turn out to be THIEVES. The second trip I made with PIA to Pakistan was a connecting from Dubai to Lahore to Islamabad. This was in December 2013, traveling for a wedding. We had two suitcases and two pieces of hand luggage, full of outfits, essentials for the wedding. Upon arrival in Lahore yet again, we waited almost an half an hour and again, the belt stopped and a hustle crowd of people went to the PIA staff desk to complain, but this time we couldn’t stay, we had to travel to the capital (Islamabad) for the wedding. The staff promised our luggage would arrive at our final destination the following day, but again we were disappointed, and so we took matters into out own hands, we contacted some officials we knew and had them contact the PIA officials to try reach our suitcase and ONLY BECAUSE OF THEM we got our suitcase A FEW DAYS AFTER WE LEFT!! After days of complaints and searches, we were not given any strings or hope! The people in Pakistan who helped us were TRUELY a breathe of fresh air, but this airline, is a DISGRACE to the country. We hope you see this as a warning and boycott and do not use the airline!! It is disgraceful and the misconduct is appalling to it’s country. Again, I traveled for a family trip for the third and FINAL TIME via PIA, a direct flight from Dubai to Islamabad, and another suitcase “left behind in Dubai” according to the airline; the plane was too small. Then why do we pay the airline money? If they cannot even transport our luggage? The problem is, PIA will allow people to take luggage over their allowance and then leave people’s luggage who STICK TO THE RULES behind. Again, after contacting the officials and high command people we knew we got our luggage back on the following day, without these HONEST PAKISTANIS we wouldn’t have got anywhere!! However, PIA are very cunning, at Dubai airport they will announce they have loaded all cargo and keep some behind, search it for useful, expensive and worthy items and even clothing!!! Then they will send it to Pakistan whether the owner is there or not. I would request you all NEVER TO USE THIS AIRLINE! IT IS A DISGRACE TO PAKISTAN AND ITS OPERATIONS. You may be thinking why we kept using them? Consistency, this is proof that it wasn’t just a one off mistake, PIA are THIEVES, LIARS AND CHEATERS!! Please note: We are by NO MEANS disrespecting Pakistan as a country or it’s common, general population, it is a beautiful country, just certain representatives and companies who claim to represent Pakistan are shameful and let the country down. P.S. There motto? 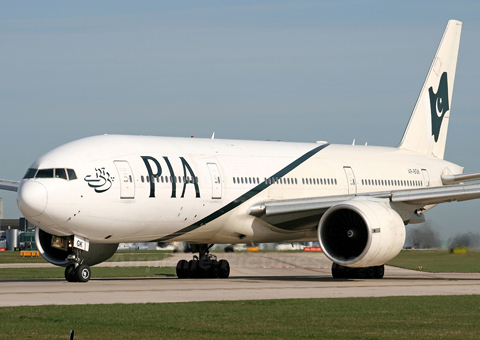 “Come fly with us”… We say “Please DON’T Fly with PIA” ! !